Finest South American brazil nuts enrobed in smooth and luxurious milk chocolate. Just the finest Brazil Nuts are gathered by hand from deep within the South American Rainforest. Just the smoothest milk chocolate is use to enrobe each perfect kernel. Just the most perfect chocolates are selected for you. Just Brazils... Just Perfection. 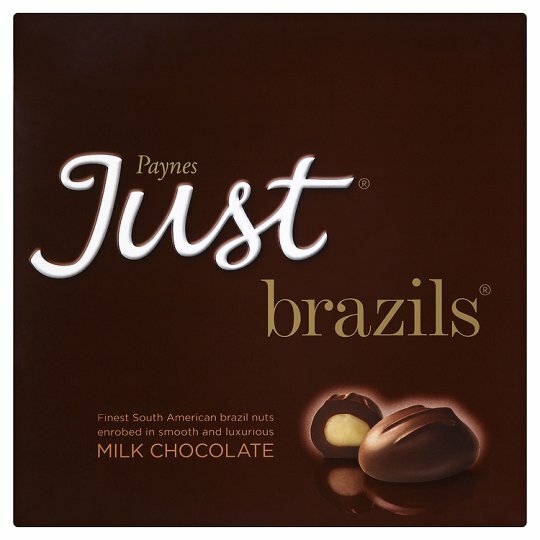 Just Brazils are also available in: Dark Chocolate. A 180g box contains 6 servings. Each serving is equivalent to 30g. We hope that you enjoy Just Brazils at their best. Should they not reach you in perfect condition, please return the complete package to the address below stating when and where purchased.